Discover Piedmont and its enchanting landscape and “the city with the most beautiful natural location in the world”, as architect Le Corbusier defined Turin. Taste the exquisite elegance, the finesse and the balance of the excellent Barolo and Barbaresco wines. You will experience the care which ensures the high level of standard quality of this wines. 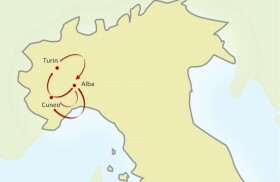 The Tour features Turin, Cuneo, Alba, Barolo and Barbaresco wine areas. One of the European capitals of Baroque, with wide boulevards and a crown of churches and castles, the capital of Piedmont, with its aristocratic atmosphere, provides plenty of interesting views. Taste Barolo and Barbaresco wines and explore the gorgeous vineyards of Piedmont. Get fascinated by one of the biggest and most beautiful royal palaces of the Savoy family and live a unique Italian lifestyle experience in Turin. Trekking excursion through the vineyards and the hamlets of this enchanting land with its breathtaking natural views and landscapes. Combine the flavors and the ingredients of Piedmont in your cooking class held in a picturesque hill location amidst the vineyards. 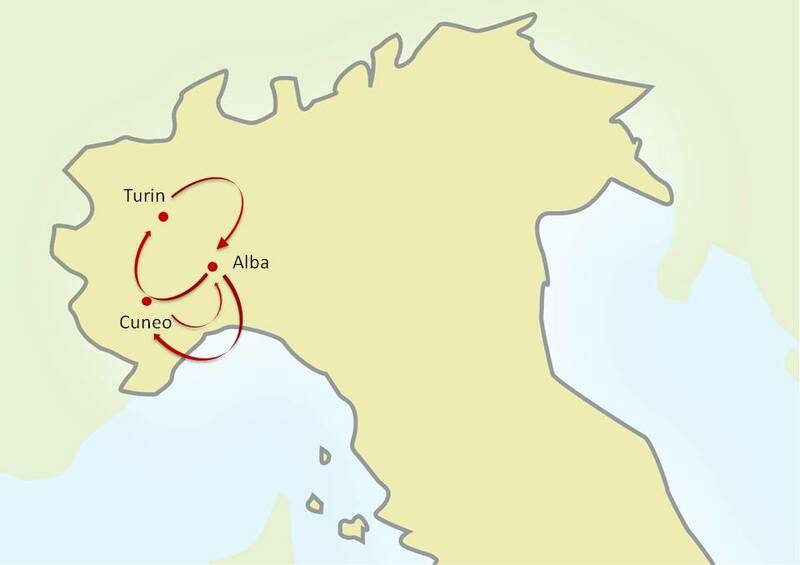 6 Nights accommodation in exclusive and fascinating 4/5 stars Hotels or Historical mansions, with full buffet breakfasts: 2 Nights in Turin and 4 Nights in Alba. Exclusive Welcome Dinner in Turin and 1 Lunch in a typical restaurant in Cuneo area. Barolo winery visit and wine tastings. Barbaresco winery visit and wine tastings. Exclusive Italian Cooking Class with an expert Chef in Alba and Dinner. Visit some of the best producers of local cheese. Private guided Tour with English speaking Guide of Turin. Guided visit of “La Venaria Reale”. 1 activity of Italian Lifestyle Experience: FIAT factory – Museo Martini di Storia dell’Enologia with Tasting of Martini and Rossi – Chocolate Laboratory and Merenda Reale – Perfumes Laboratory of Laura Tonatto. Guided Tour “Castello di Grinzane Cavour” and the “Enoteca Regionale Piemontese Cavour”. Local wine tastings in a beautiful set within the castle. Trekking Excursion in the Barbaresco / Barolo area. Private transfers by deluxe van with English speaking driver from and to the airport. The Tour is available as self drive or by private deluxe van with English speaking driver available for transfers and excursions for the entire Tour. Tour begins and ends in Turin. Exclusive Gourmet Welcome Dinner. Explore the highlights of the capital of Piedmont region. A Guide will take you to discover the first capital of modern Italy with its pleasant atmosphere: the Po river flowing through the city, the gentle hills overlooking the city and scattered with pleasant villas and surrounded by the Italian Alps skyline. Admire beautiful palaces and churches built in Baroque style during the kingdom of the Savoy family, such as “La Venaria Reale”, one of the biggest and most beautiful royal palaces of the Savoy family, recently renovated and brought back to its former splendor. Enjoy an Italian Lifestyle Experience: want to visit the FIAT factory? The Martini Museum di Storia dell’Enologia with Tasting of Martini and Rossi? Want to try the Merenda Reale with Bicerin at the chocolate laboratory? Or smell Laura Tonatto’s Perfumes and fragrances? Cooking class to discover the roots of the local food and wine culture with an expert chef. Learn recipes to create your own typical dishes of the Langhe and Roero region in a picturesque hill location amidst the vineyards. Dinner based on the dishes prepared. Experience the famous Barbaresco and Barolo wines. Winery visits and wine tastings of the top producers of the area. Excursion dedicated to hand-crafted cheeses, visit some of the best producers of local cheese (Bra, Castelmagno, Murazzano, Raschera, Toma Piemontese, Robiola d'Alba, Tuma di Bossolasco, Tomini delle Valli Saluzzesi, and Brus) to discover Italian cheese world which is certainly up to the quality of the best French cheese. Lunch in a typical local restaurant where cheese is used as the main ingredient for local dishes (starting from the famous Gnocchi al Castelmagno). Trekking excursion through the vineyards and the hamlets of this enchanting land: admire breathtaking natural views and landscapes along the banks of the Tanaro river, through the world famous Barbaresco crus or across hills and through vineyards, exploring the Barolo castles. Visit the “Castello di Grinzane Cavour” and the Enoteca Regionale Piemontese Cavour inside the castle itself, a prestigious showcase for the very best Piedmontese wines and grappas. Local wine tastings in a beautiful setting within the castle.